In the cryptoasset space, Ethereum is always the flavour du jour. There is never a shortage of excitement and/or drama in and around it. Whether it is its governance woes, the delivery of Ethereum 2.0, or Vitalik’s t-shirts, there’s always something to grab the imagination of contributors and pundits alike. Fundamentally, the mere fact that Ethereum commands so much attention is beyond warranted; it is the undisputed #2 in crypto, single handedly ushered the concept of Smart Contracts into production, and gave birth to (at least) three fascinating phenomena — the ICO, NFTs and DeFi. Yet, as we are slowly emerging from crypto winter, it seems as if Ethereum has been left somewhat bruised, with many question marks around its future. In the following sections I will attempt to uncover the current state of Ethereum by looking at various key on- and off-chain metrics. We dive head-in by taking a look at the state of the Ethereum blockchain via key on-chain metrics. Active addresses are defined as those that have engaged in cryptocurrency transactions at any point during the last 24-hours. Mirroring the activity in Bitcoin, it appears that the trend in active addresses has changed to the upside, after about 9 months of consistent decline (along with ETH’s price). Also, since late 2018, we are observing a divergence between the trends in price and active addresses. Will price trail back to active addresses? Not unlikely given the historical trend. Velocity points to the average number of times that a token changes wallets each day. Simply put, a higher token velocity means that a token is used in transactions more often within a set time frame. 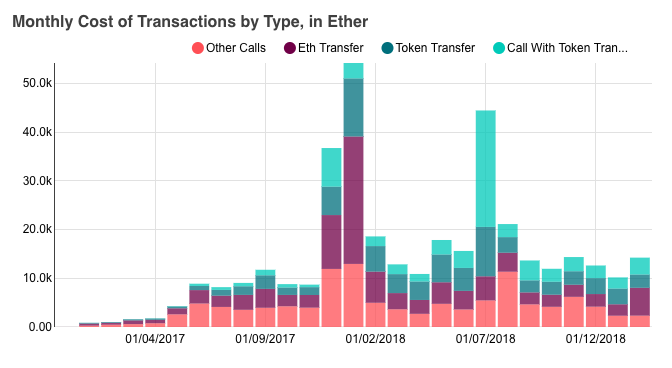 Discounting for activity attributable to the notorious Ethereum mixer, both velocity and transaction volume seem to be growing linearly, on a trend that dates back to early 2016 — what is arguably a positive sign, nodding to increased utilisation of the network. 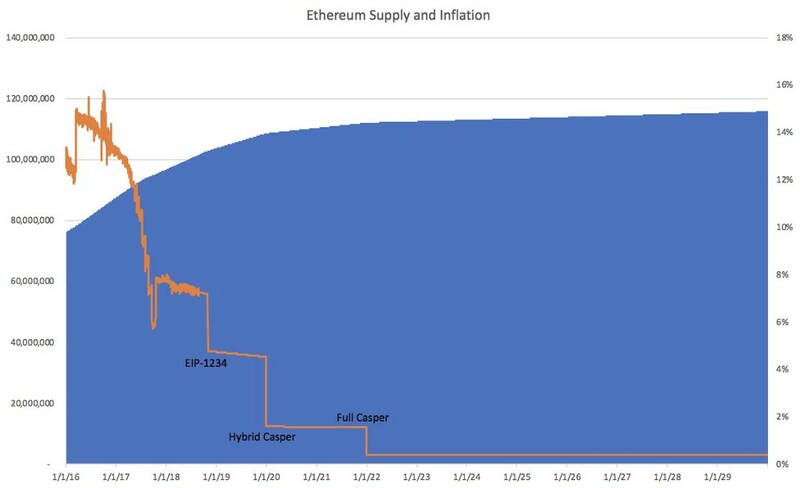 What this might additionally imply, is that an exponential phase (S-curve) in transaction volumes is still a possibility in the future — though hard to imagine given the current performance limitations of Ethereum. DeFi (shorthand for decentralized finance) is the second big use case (after fundraising via private money) currently being explored on Ethereum and finding product-market fit. While the growth recorded so far has been impressive, the explosive part seems to have stalled for now. How much of this is due to the DAI’s peg woes and the stability fee hike from 0.5% to 7.5% in Maker (making it less attractive to own CDPs), and how much is due to the space having reached a structural ceiling for now, remains to be seen. My guess — a bit of both! After all, we need easier access to this ecosystem for the next batch of users to come on board. On to the first major use case that ushered Ethereum into the cryptoasset pantheon, we take a look at what happens in the world of tokens under the “world computer”. At present, the majority of the Ethereum network is overrun by ERC-20 type tokens; for all their promise, ERC-721’s (NFTs) and other emerging standards, still represent a marginal amount of activity on the network. Further, ~4k seems to be the equilibrium number of active tokens on the network — tentatively driven by both lack of further demand AND lack of network capacity. This metric expresses the Average Gas Used/Gas Limit at any given point in time and acts as proxy to comparing utilisation with capacity. Interestingly, the picture here seems to verify the assumption laid out above, with respect to network capacity, and points to the fact that this particular S-curve has plateaued. 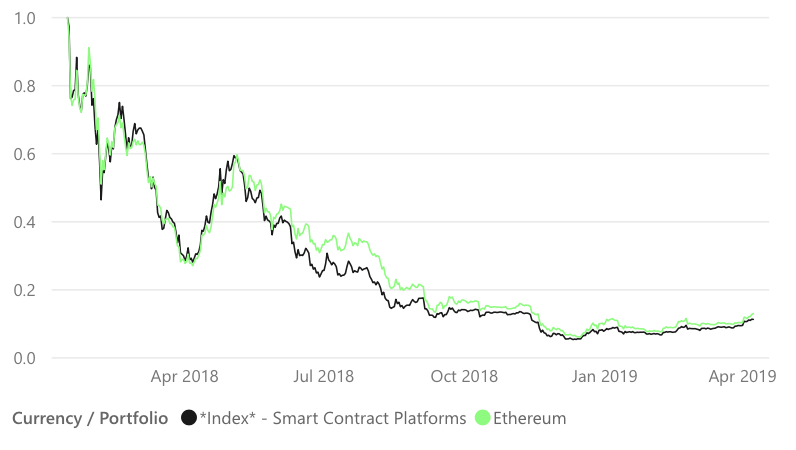 The three charts above, together describe the state of smart contracts on the Ethereum network — at a high level. From February until present day, the aggregate smart contract calls (interactions with smart contracts) have picked up, and are verging towards all time high territory. 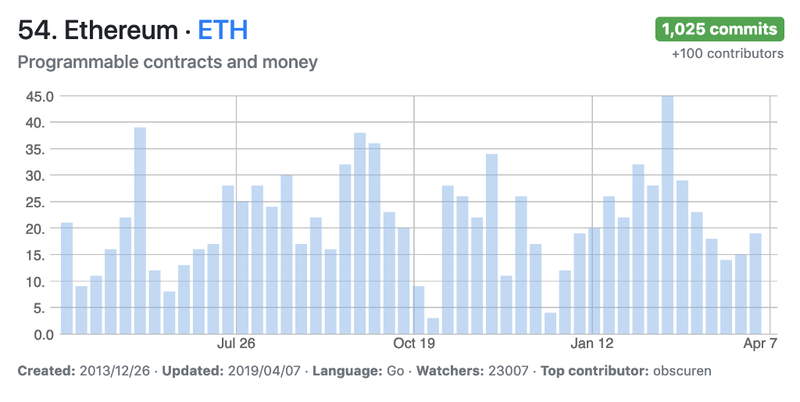 Given that we are post speculative mania, and ICO activity is in multi-year low, at the very least, this implies that the utility to speculative value ratio in Ethereum is improving — indication of such activity correlates nicely with the rise of DeFi. Now as far as Gas cost is concerned, the levels have been stable throughout 2018 — with an exception in July 2018, when F-coin spammed the Ethereum network (hence “call with token transfer” and “token transfer” costs exploded). Once again, stability here might imply that we’re operating close to network capacity. Finally, things get a little more curious when considering Daily Gas cost in USD, as it appears that for the past 12 moths, all 4 types of smart contract calls cost the same in USD terms, a phenomenon not observed before April 2018. One more sign of maturity, and/or the fact that the network is at capacity? Likely! On-chain is only half the story. In this section we phase into market data, by looking at the most relevant to market, on-chain metrics, and subsequently transition to purely market focused metrics. As with Bitcoin, reductions in inflation seems to have a similar effect on price (upwards push). Looking ahead to 2020 and 2022, there are two more big inflation adjustments coming, with the steeper one being the one in 2020. Combined with Bitcoin’s halving, this is a structurally bullish development — assuming that demand for the asset remains constant, at the least. This metric shows the amount of tokens changing addresses on a certain date, multiplied by the number of blocks created on the blockchain since they last moved. One way we can interpret this, is as a proxy to long time HODLer coins moving, potentially to liquidate. The activity here mirrors that in Bitcoin — once again, with the most tokens moving after November’s dump, pointing to capitulating long term holders, among which tentatively a bunch of early ICO treasuries and a slew of unprofitable miners. While Ethereum pretty much created the category, its dominance has gone down from ~90% in mid-2017, to ~58% in the Smart Contracts cluster. Further, since April 2017 it has underperformed the cluster consistently in bull-market conditions, and has tracked the cluster’s performance (or more likely, the other way around) in bear market conditions, while the correlations of returns between Index and ETH standing at over 90%! 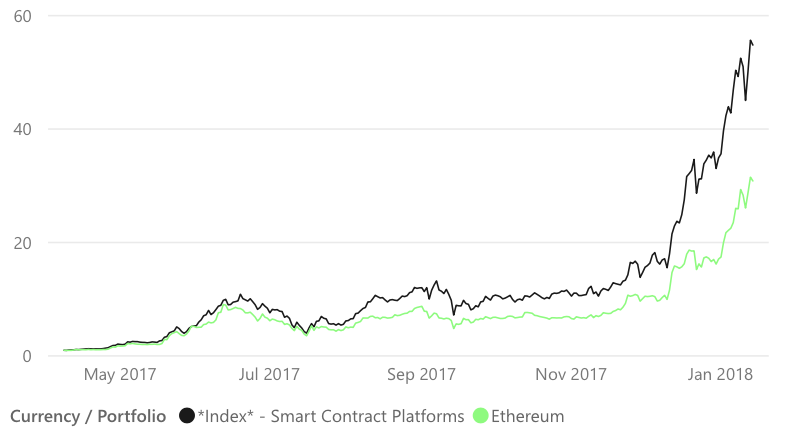 With competitors like Cosmos, Dfinity, Polkadot and Hashgraph (among others) having launched recently or launching soon, and Ethereum 2.0 being a long way off still, it’s hard to see this trend reversing or even stabilizing. Given the high correlation of ETH with Bitcoin, returning volatility in Bitcoin, implies that volatility returns in ETH too — and by the looks of the 60-day volatility chart this is already materializing. Considering that this has been a resounding move towards leaving the bear trend behind — a view held by many and based on many different data points — there might be significant room for short-medium term upwards movement. 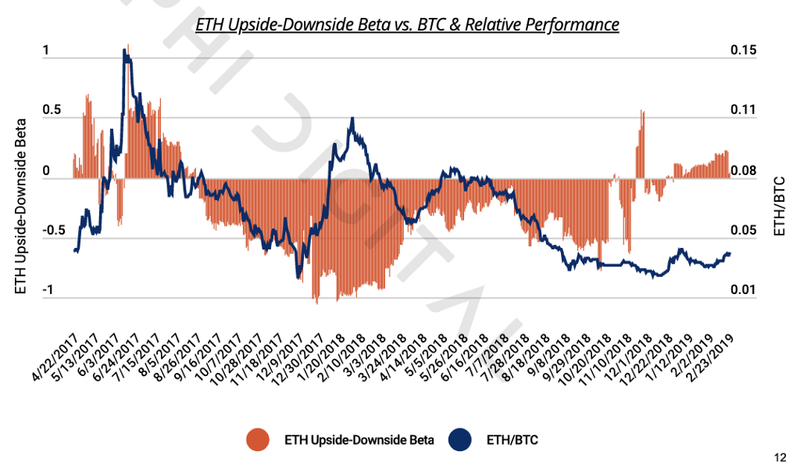 The recent analysis from Delphi digital on ETH/BTC and its relation to upside-downside beta, implies that this might indeed be the case. Contrary to Bitcoin, the Hashrate in the Ethereum network seems to be following a negative trend and has yet to pick back up. What this implies, is that the network is not yet at equilibrium, with the current prices making ETH mining unprofitable for many. Reports have it that the break even for ETH miners stands at about $150-$200 per ETH. There are a few reasons as to why this might be the case, among which are (i) the fact that Ethereum is planning to migrate to PoS, (ii) the fact that Ethereum mining utilizes GPU chip sets and (iii) the fact that compared to Bitcoin, Ethereum’s inflation rate is still high. One thing that was relatively positive for the Ethereum ecosystem, that resulted directly from the downfall of prices from a top of ~$1.4k to current levels, was the fact that relative space occupied by smaller miners grew — at the expense of the Top3 to Top10 mining pools, such that now more smaller miners are represented at the table. At the same time, the Top 3 pools grew their share, as they are likely the only ones with the required operational excellence (cheap electricity, low overheads otherwise) to be able to adequately withstand the price drop. In this section, I look at a couple of proxies to the development activity in the Ethereum ecosystem. A quick scroll down cryptomiso paints a very positive picture. Off the Top-100 projects ranked by Github activity, while Ethereum might rank around the middle, it’s one of the projects with the most consistent activity pattern. If slow and steady wins the race, and given the mindshare that Ethereum has captured, then this should count as a net positive for the underlying asset. Ethereum’s popularity as a Web 3 development platform is beyond doubt, and part of the reason why is the availability of tooling in building on the platform. 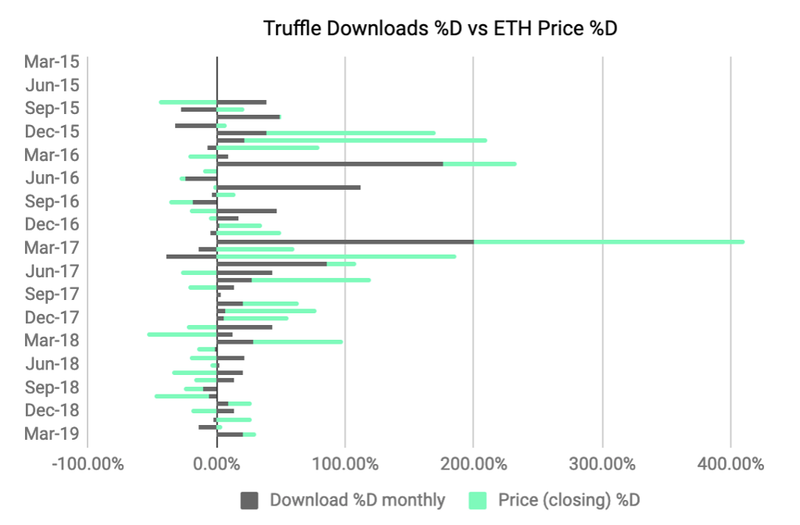 There are some interesting notes to take here; (i) Ethereum’s price rise in H1 2017 was the biggest ad for Ethereum as a development platform, (ii) there is a low positive correlation between ETH’s price swings and downloads in the Truffle framework and (iii) the exponential growth rate in downloads observed until January, is showing signs of slowing down. Maybe a sign that Ethereum is reaching developer bandwidth capacity (re: SAM)? Perhaps. 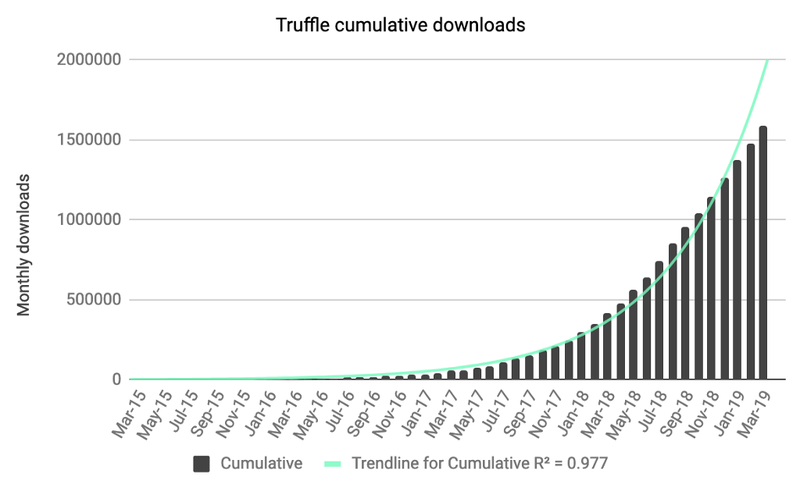 On the other hand though, it would also appear that the reducing volatility in Ethereum is coinciding with the reduction in the growth of downloads. Could it be that less volatility, leads to less headlines, that in turn leads to less people reached? 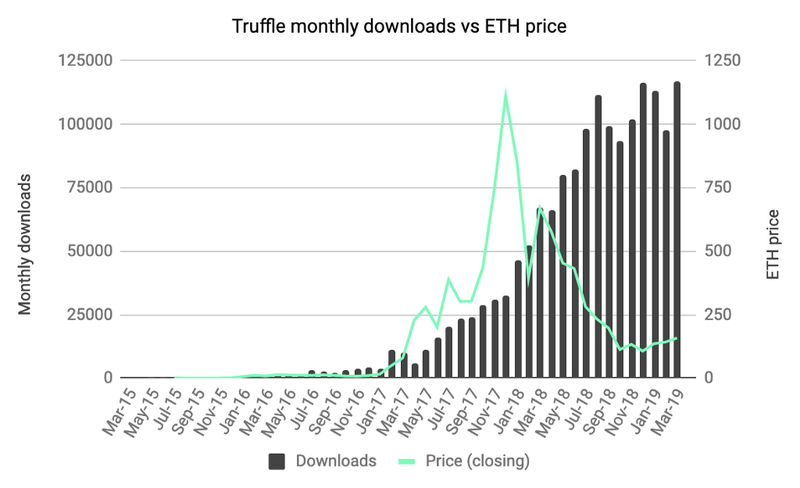 And what would happen to downloads in case we saw an uptick in ETH’s price? No particular category they slot under, but still important to consider. The plots above show (i) the geographical dispersion of nodes and (ii) the segregation of nodes across client and OS. The large majority of the Ethereum network’s nodes are found in the US — and it appears so by some difference from the second highest concentration (China), while Geth is by far the most popular client type (over 75% of nodes), with Web 3’s Parity coming in second (~12% of nodes). Also worth noting that there are over 9600 nodes running Bitcoin, which is ~18% more than in Ethereum. The transition from PoW to PoS, implies that ETH holders will be able to stake their ETH (min requirement: 32 ETH) and earn validator’s rewards — which should make the network more decentralized and robust. 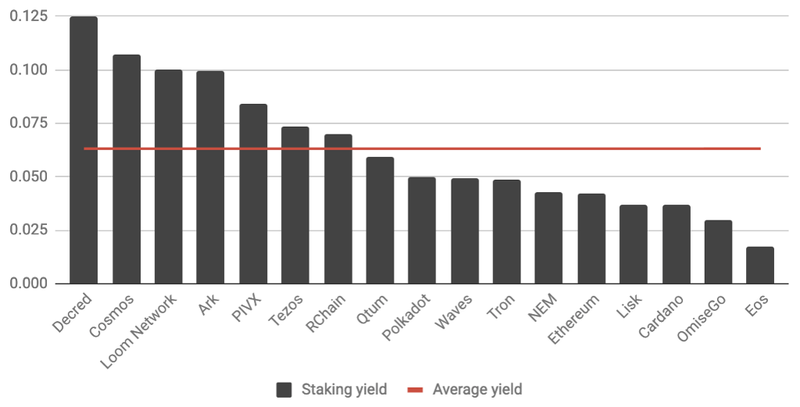 That said however, Ethereum will arrive to the staking party quite late, AND with below average staking yield. Even yet, some money is always better than no money, and for long term ETH believers and would-be believers, this is an interesting incentive that could sway parties to increase their allocations. Taking the rise of DeFi as well as the rise in active addresses and reduction in median transaction value of ETH as indicators for fundamental value, along with the drastic reduction in new issuances (ICOs), one can argue for a substitution effect between low quality, speculative value, with high-quality fundamental value. 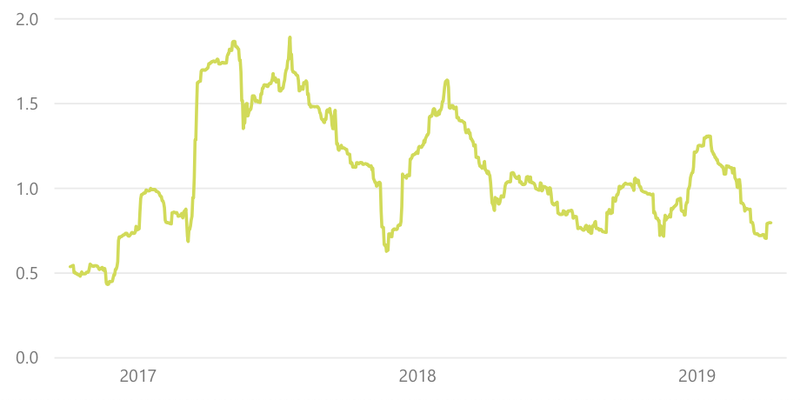 Combined with the recent reduction in the inflation schedule and the upcoming one in 2020, along with recent long time holding liquidations, implies that we likely found a bottom and this gives Ethereum some nice headway for price appreciation. The reshuffling of hash-power towards a more balanced distribution, along with the upcoming PoS incentives, points to a more secure network long-term. Developer activity is as healthy as ever. That said, in the last couple of months we are seeing signs of the activity slowing down. Perhaps a sharp(ish) rise in price, will create the necessary uptick here (cc: reflexivity). There are strong indications that the network is operating at capacity and demand/supply for network resources is at equilibrium. Should more demand hit the Ethereum network, we will then likely be in an excess demand condition; short-medium term, this is should be a price positive, but long term, considering the existing and emergent competition, operating at the current level of capacity is a net negative — as developers pack up for greener pastures, with lower fees and more clarity over the roadmap. Ethereum; in a state? was originally published in Hacker Noon on Medium, where people are continuing the conversation by highlighting and responding to this story.